The Class A uniform consists of the khaki shirt, green epaulet loops, belt, neckerchief and slide; pants, socks and hat are optional. The shirt needs the following patches: CT Yankee Council Strip on the left shoulder, green 431 numerals under the council strip, purple World Crest over the left breast,. Rank awards go on the left pocket and the Arrow of Light award goes underneath the left pocket. Patrol Patches go under the flag on the right shoulder; leadership position patches go under the troop numbers on the left shoulder. 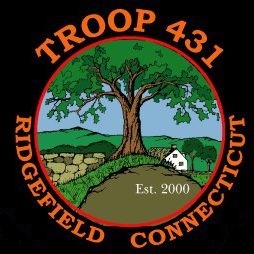 The troop provides the neckerchief and Class B orange T-shirt.